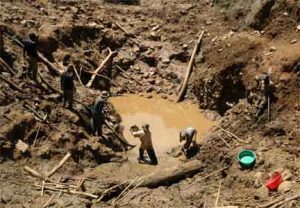 Cardiac and communicable diseases are reported to be on the rise across communities in the Ashanti Region, where illegal mining has been pronounced. Regional Director of Health, Dr. Alexis Nang-Beifubah, said the massive pollution of air, water bodies and the environment through uncontrolled activities of the miners, was to blame for the disturbing situation. He also complained of a high prevalence of sexually-transmitted infections in those areas. Speaking at a meeting held with members of the Parliamentary Select Committee on Health, in Kumasi, Dr. Nang-Beifubah, indicated that the illegal activity was having serious implications for healthcare delivery. The Committee, led by Dr. Kwabena Twum-Nuamah, is on a three-day working visit to the region to meet and hold discussions with the heads of the various health institutions and agencies. This is to enable the members to have a better understanding of their operational challenges and how to effectively tackle them. Dr. Nang-Beifubah said apart from the health hazards, deep uncovered pits left by the miners posed a constant threat to the lives of the people. It was on the account of this that everything should be done to sustain the fight to stop illegal mining, he added. He said it was in everybody’s interest that mining was done in a more controlled, properly regulated and sustainable manner. The Committee had earlier visited the Kumasi South Hospital, where the Medical Director, Dr. Kwame Ofori Boadu, mentioned inadequate funding, space, and equipment as their major headache. These, notwithstanding, they had been giving it their all, to bring quality health care to a population in excess of 50,000. He expressed confidence that the government would move quickly to complete the Regional Hospital project at Sewua to create adequate space to enhance the quality of care. Dr. Twum-Nuamah applauded the health professionals for the good job they had been doing and urged them to continue to work hard and with a passion to save lives. The Committee later inspected a spraying exercise being carried out at Santasi by Zoomlion Ghana Limited, at mosquito breeding places to help reduce malaria cases. This is being done under the Nationwide Mosquito Control Programme.